With a big surprise they open their eyes and 1: they are not dead, 2: they think it’s good!!! because of course it’s good, really gooood!!! 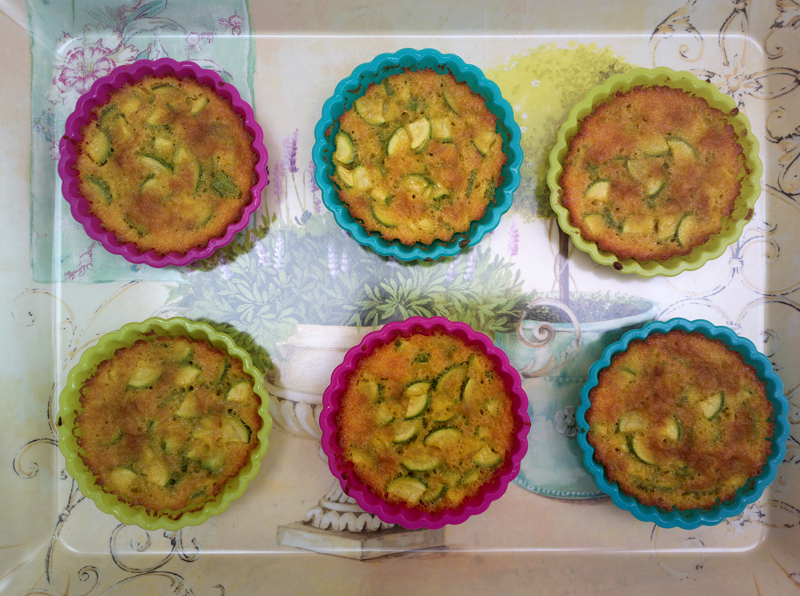 Zucchini melts inside the sponge and they do what fruit does inside cake, bring moisture. So the cake is wet, soft, spongy and palatable. It’s a really easy and fast recipe. And also a light one (only 50 grams of butter). 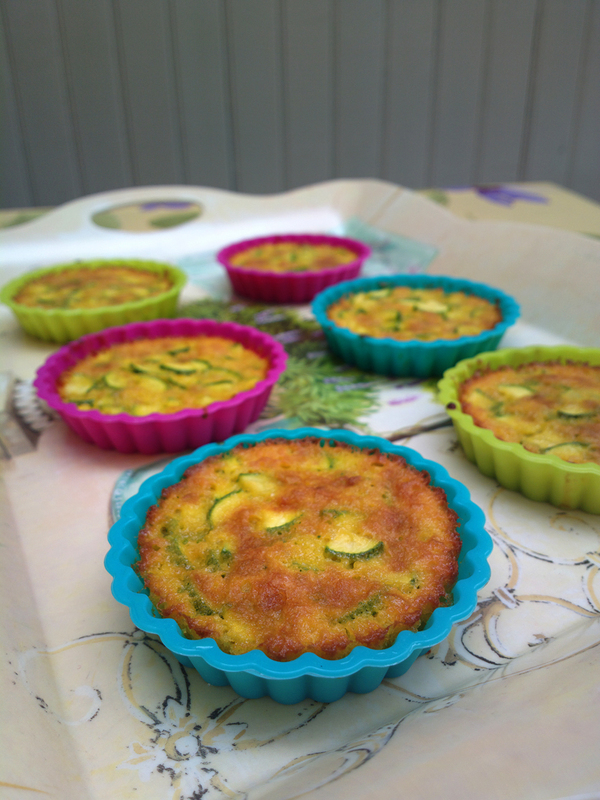 It looks like a flat cake, we use to say “schiacciata”, because it contains very few baking powder. A lot of cakes from my region, Tuscany, don’t have it (or a very little quantity) in their doughs, it’s one of their main features. 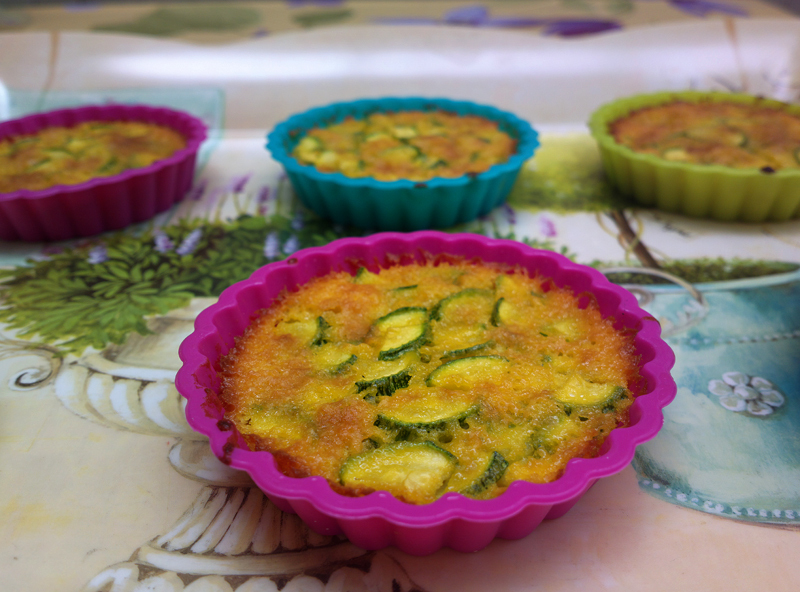 Scarpaccia is usually prepared into a big baking tray, but I prefered to do some cute and colourful single-servings. Clean zucchini and cut the two ends. Then cut each zucchini lengthwise so you get 4 slices. Cut each slice into thin layers (about 2 millimeters thick) so you get little triangles. This is the most time-consuming and boring part of the cake. Melt the butter using the microwave, then add milk to cool it down. In a bowl mix eggs with sugar, don’t beat too much, they must remain quite liquid. Add the mixture of butter and milk, still beating, and then cognac. In another bowl sift flour with baking powder and vanilla. Add them to the dough, just keep in mind it will remain quite liquid. 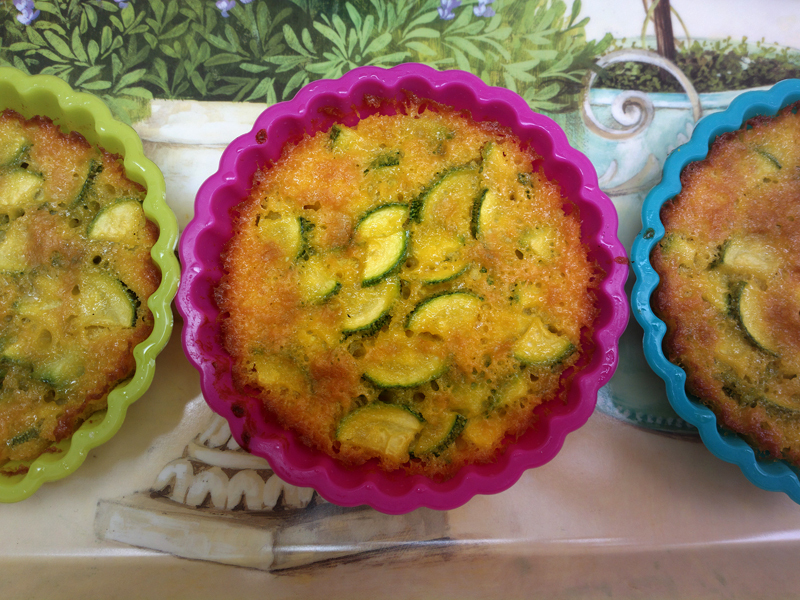 Put also zucchini, blending by hand, and let it rest for 5 minutes, so zucchini will fall on the bottom of the bowl. Grease and cover in flour one baking tray (28 cm) or 12 single-servings (10 cm). Place inside a preheated oven (180° C) for about 40/50 minutes for the cake, and 20 minutes for the single-servings. The surface should be golden when well baked. anyway you should open your email address, click on the email you get from this blog and you should find a link where is written “cancel notifications/registration” or something like that! or at least it works like that for my email and all the blogs i follow and from which i get notifications.